The ASUS ROG Strix Z390-F Gaming motherboard supports 8th and 9th Generation Intel Core i7 / i5 / i3 processors in the LGA1151 package and has two 32GB/s M.2 slots. The ASUS ROG Strix Z390-F Gaming amps the power delivery and stacks a comprehensive set of cooling options to tame Intel's latest CPUs. 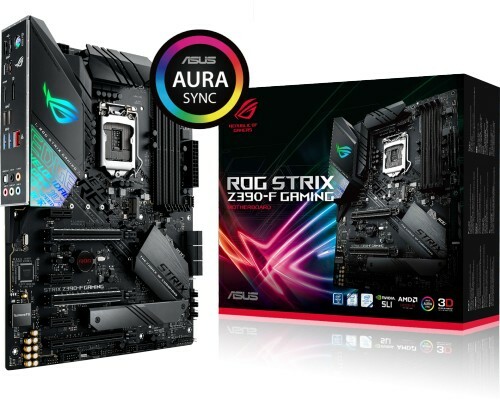 Together with a wealth of enhancements, including one-click optimisation, the latest connectivity and futuristic styling with onboard illumination, ROG Strix Z390-F Gaming makes a formidable foundation for ATX gaming builds that go above and beyond. With comprehensive cooling options and upgraded power delivery to fuel CPUs with more cores, plus support for faster memory and storage, ROG Strix Z390-F Gaming provides all the essentials you need to harness the full potential of components in your build for top-tier gaming performance. A host of design touches, including a unique cyber-text pattern, plus customisation options, comprehensive validation lists, and the most diverse ecosystem of components in the industry make building and personalising a gaming rig with ROG Strix Z390-F Gaming wonderfully easy. 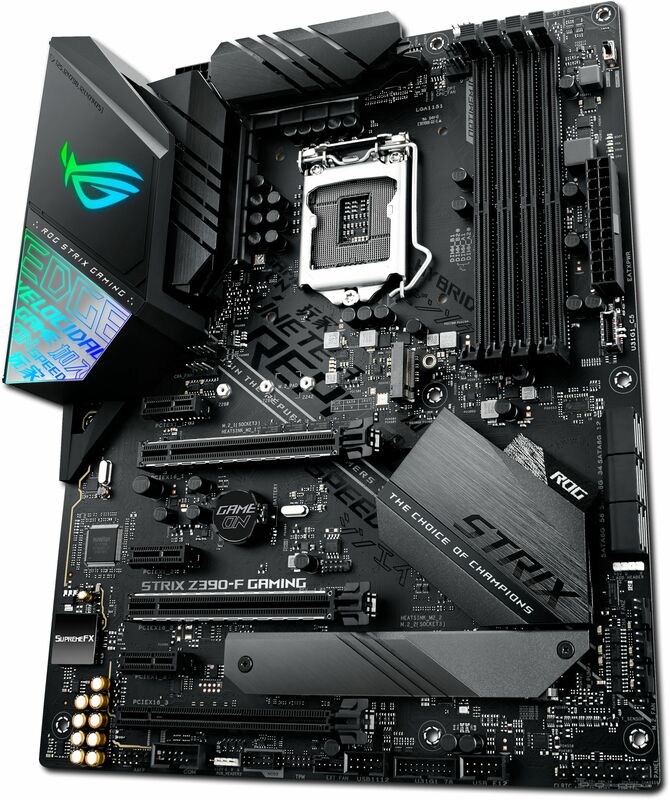 The ROG Strix Z390-F Gaming motherboard features firmware controls and software utilities designed for all skill levels, making setup, tuning and system maintenance simple. With options from overclocking and cooling to managing network performance and audio characteristics, you can configure your ROG Strix gaming build to perform the way you want. Take care of complex tuning with just one click. ASUS 5-Way Optimisation is a system-wide tuning utility that overclocks the processor and tunes fan speeds to ensure the best balance between cooling and acoustics. The automated CPU tuning feature of 5-Way Optimisation leverages the same onboard intelligence as AI Overclocking,but goes further by running a Prime95 based stress test to deliver a result that's well-tuned from the get-go. Enjoy comprehensive control over fans, water pumps and all-in-one (AIO) coolers, via either Fan Expert 4 or our award-winning UEFI. Whether you're cooling with air or water, Auto-Tuning mode intelligently configures all parameters with a single click. There's also an Extreme Quiet mode, which reduces all fan speeds to below the default minimum — keeping your system whisper-quiet when performing light tasks. Immerse yourself in sound with SupremeFX audio technology. Utilising the S1220A codec, SupremeFX is the integrated-audio solution that's engineered to provide a flat frequency response for a neutral, detailed sound signature. And to ensure that pristine signature is perfectly preserved, the front-panel output is driven with dual op amps, delivering sonics with the scale and authority to create virtual worlds via your gaming headset.